I am wary of writing a post about the water cycle as I so rarely teach it. It seems too much like common sense to me to require any elaboration in class, but perhaps writing this post will sooth my guilty conscience for Y10 and Y11 students? The processes that happen in the water cycle are almost all nothing to do with Biology. Water evaporates from lakes, streams and the sea. Evaporation is when thermal energy from the sun changes water from a liquid to the vapour state. The warmer the day, the more evaporation will occur. The biological component here is that water evaporates from the above ground parts of a plant. This process is called transpiration and mostly happens through the stomata (tiny pores in the lower epidermis of the leaves). 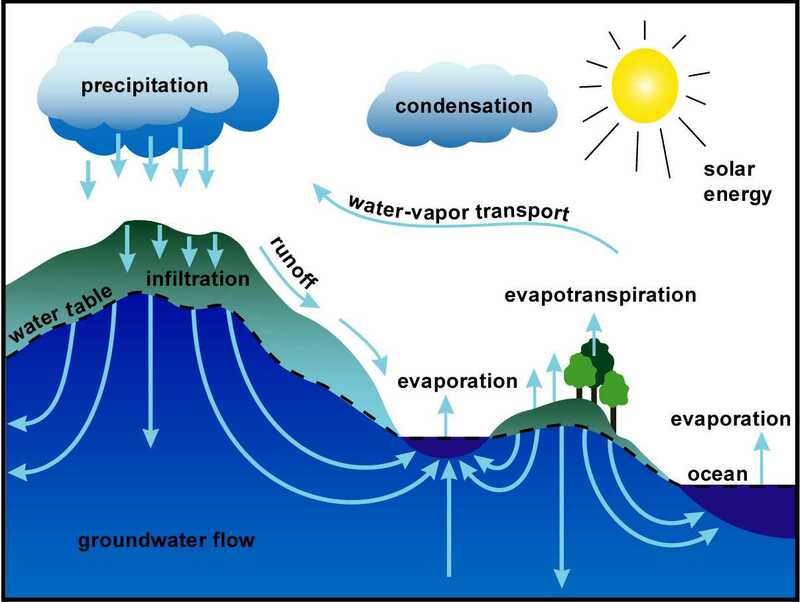 Geographers like to combine “transpiration” with the “evaporation” of water direct from the soil to come up with the exciting term “evapotranspiration”. Water vapour condenses in the atmosphere to form clouds and then water falls as a liquid as rain/snow/hail which can be combined together as precipitation. That’s the water cycle for you: couldn’t be much simpler really, could it? Just to finish, check your A* understanding of transpiration by answering these questions – if you are feeling really digital, why not add the answers as a comment at the foot of this post? 1) When are stomata open in the leaf and when do they close? 2) What four environmental factors can speed up rates of transpiration? 4) In what ways would you think of transpiration as a “necessary evil”? The topic of plant transport can appear quite complicated but you will see from your past paper booklets that the questions examiners tend to set on it are much more straightforward. The key piece of understanding is to realise that there are two transport systems in plants, learn their names and what they transport. 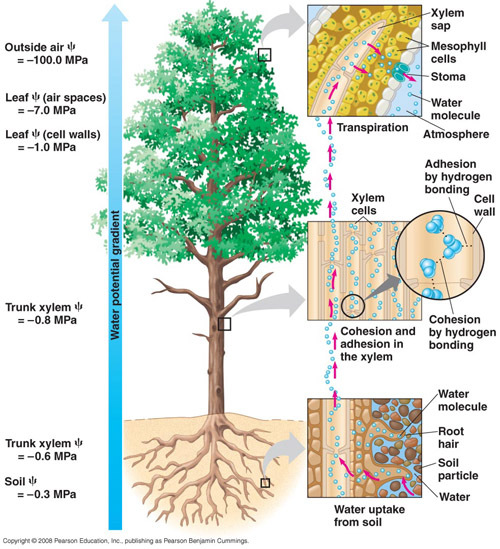 Xylem vessels move water and mineral ions from the roots to the leaves. Phloem sieve tubes move sugars, notably sucrose, and amino acids around the plant. Both of these molecules are made in photosynthesis in the leaves and so can be transported from the leaves to the areas in the plant where they are needed. Water is needed for photosynthesis of course in the leaves (remember that rain water cannot enter leaves directly because of the waxy cuticle on the surface of the leaf). All the water that is used in photosynthesis is absorbed in the roots from the soil and moved up the plant in the xylem vessels. Minerals such as nitrate, phosphate and magnesium ions are also required in the leaves for making amino acids, DNA and chlorophyll respectively. These minerals are moved up the plant along with the water in the xylem. How does water enter the roots from the soil? Water molecules can only enter root hair cells (and indeed can only cross any cell membrane) by one mechanism and that is OSMOSIS. If you understand the mechanism of osmosis that is great but don’t worry too much about it at this stage. You need to know that osmosis is a net movement of water from a dilute solution to a more concentrated solution across a partially permeable membrane. How do mineral ions enter the roots from the soil? What do we know about xylem vessels? The cells that water and minerals are transported in are called xylem vessels. They have some interesting specialisations for this function. They are dead cells that are empty with no cytoplasm or nucleus. The end walls of these cells break down to provide a continuous unbroken column of water all the way up the plant. The cell walls of xylem vessels are thick and strengthened and waterproofed with a chemical called lignin. What causes the water to move up the xylem? A great reminder of how difficult it must be for a tree to move water up xylem vessels to such a great height. Plant biology is always way more complex and confusing than you would think.